Built in 1928 as Boston's first Art Deco style skyscraper, the 15-story Hilton Boston Downtown Faneuil Hall now stands among the city's downtown high-rise towers. The Batterymarch Building, as it was originally known, was designed by architect Harold Field Kellogg, and remains an architectural landmark. With it's superb location to the Faneuil Hall and Quincy Marketplace, the Boston Waterfront, Boston's Historic Freedom Trail, and the many businesses of the Financial District, this AAA Four Diamond hotel provides a perfect setting for both business and leisure travelers. 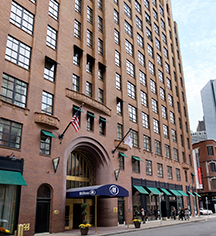 Hilton Boston Downtown Faneuil Hall, a member of Historic Hotels Worldwide since 2015, dates back to 1928. This hotel was Boston’s first Art Deco skyscraper, originally designed as an office building by architect Harold Field Kellogg. Deposit: A credit card is required, but we do not require a deposit at time of booking, unless it is a pre-paid, non-refundable rate. 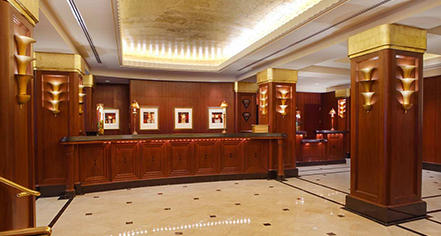 Early Check-In/Late Check-Out: Late Check-Out Fee: $50.00 Based on Hotel's availability. Extra Person Fees: $20 per person. Hotel/Resort Fees & Taxes: Taxes: 14.45%. Parking: Self-parking: Not Available. Valet parking: $51.00. Secured: Available. Covered: Available. In/Out Privileges: Available Other Parking Information: Add'l fees before 1pm/after 4pm. Max height 6'6. Payment: All forms of payment are accepted. Payment is required at time of booking. Visa, MasterCard, Amex, Diners Club, China Union, and Discover are accepted. Pet Policy: Service animals allowed: Yes. Pets allowed: Yes. Deposit: $75.00 (Non-Refundable). Maximum Weight: 75 lbs. Maximum Size: Large. Other Pet Services: Dogs only allowed; cannot be left alone. Built in 1928 as Boston's first Art Deco style skyscraper, the 15-story Hilton Boston Downtown Faneuil Hall now stands among the city's downtown high-rise towers. The Batterymarch Building, as it was originally known, was designed by architect Harold Field Kellogg, and remains an architectural landmark. Learn more about the History of Hilton Boston Downtown/Faneuil Hall .